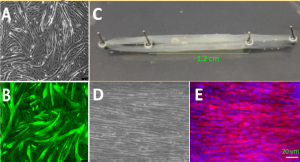 We bioengineer three-dimensional (3D) skeletal muscle, using human derived muscle cells grown from muscle biopsies as well as from muscle cell lines. Importantly, we conducted the first research internationally to model ageing in these lab grown ‘mini-muscles’ and contributed to work that produced the first healthy human ‘mini-muscles’ in self-assembling bioengineered systems, resulting in high tier publications in Aging Cell (IF, 7.6, Click for PDF) and Biomaterials ( IF, 8.8, Link). 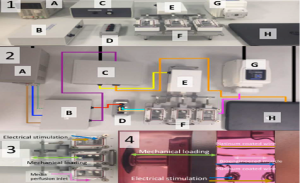 Furthermore, in collaboration with Professor Mark Lewis and Dr. Neil Martin (Loughborough University) we have published work on the role of mechanical loading (mimicking aspects of exercise) in these bioengineered muscle systems (Player et al., 2014, link). The Sharples Muscle Lab have recently secured external grant funding in this area via: i) The Rugby Football Union, UK, ii) GlaxoSmithKline (GSK) and; iii) The Society for Endocrinology UK, to purchase novel, custom designed bioreactors that allow physiological loading (both electrical/mechanical stimuli simultaneously) in bioengineered muscle. We have recently had a manuscript published in J Cell Physiol (Kasper, Turner et al., 2018, link) and recently published (Methods in Molecular Biology- link) describing the use of ‘contracting muscle’ bioreactors for investigating skeletal muscle adaptation to exercise mimicking stimuli. Daniel Turner is now spearheading this work in the lab. The work will hopefully enable us to investigate epigenetic adaptation to exercise, and develop a model system to investigate the impaired response in skeletal muscle to exercise and nutrition in sarcopenia using lab-grown aged human bio-engineered muscles. Figure above: A Skeletal muscle cells in standard monolayer cultures by light microscopy and; B fluorescent microscopy (green – actin). A & B Show myotube formation is swirling in monolayer due to no uniaxial tension or three-dimensional (3D) matrix in these cultures. C Macroscopic image of our bioengineered skeletal muscle. D Light microscope image of our bioengineered muscle and E fluorescent image of myotubes in our bioengineered muscle (red – desmin, blue -nuclei). D & E Show that myotubes align in parallel within a 3D biological scaffold when put under uniaxial tension from the engineered culture system. All images are unpublished from the Sharples Muscle Lab. Daniel Turner took the images of the bioengineered muscle. Figure Above: The Sharples Muscle Lab’s bioreactor that allows mechanical stretch (eccentric lengthening) and electrical stimulation (concentric contraction). This stimulation can be applied alone (stretch or electrical stimulation) or in combination (lengthening/shortening plus electrical stimulation) in order to more closely mimic a physiological muscle contraction and exercise. Image from Kasper et al., 2018. Journal of Cell Physiology (Link). The Sharples Muscle Lab in collaboration with Loughborough University (Martin & Lewis) we have recently obtained EPSRC grant funding (Government Research Council UK- RIUK-, Sharples PI) for a PhD studentship (Piotr Gorski) to develop the first aged human bioengineered skeletal muscle using isolated muscle stem cells from elderly individuals and investigate the epigenetics of sarcopenia and ‘anabolic resistance’ in response to exercise and nutrients. This is important because elderly individuals have an impaired anabolic (growth) response to acute and chronic mechanical stimuli such as physical activity/ exercise. They also possess a blunted response to nutrient feeding, such as amino acids. This dysfunction, termed anabolic resistance, is a strong contributing factor to age-related muscle wasting (sarcopenia). Using our bioreactors we can enable simultaneous mechanical loading and electrical stimulation as well as controlled infusion of amino acids to the elderly bioengineered skeletal muscle and compare this with bioengineered muscle from young healthy adults. This will help us understand the mechanisms underlying the blunted response to exercise and nutrients observed in aged human vs. young adult muscle. Importantly, because these are in-vitro (in-culture) human systems we can undertake genome engineering or pharmacological treatments in a more physiologically relevant (to humans) environment, as a tool for pre-clinical screening, without unwarranted studies in animals.